Merry Christmas and Happy Holidays to all my friends out there. Here's a look back at some of the holiday adventures of Darth Cooper. Over the last few years I've had the honour of participating in the Children's Healthcare of Atlanta Christmas Parade. This year I wasn't able to join in due to work commitments. The parade is a wonderful event that helps raise money for Children's Hospital here in Atlanta. If you're interested in helping out this year, click the link. Hit 90,000 miles today. Wow. I drive too much. Mario, the sales guy, is going to get a battery & check the Porsche database for the records. Fingers crossed! Today DC hit 87,800 miles. It's hard to believe that I've been driving the car for that long. There were a lot of bumps along the road (so to speak), but it's been loads of fun overall. Here's to many more miles to come! I need to get new window graphics put on the car since the current ones are fading bad. Since my old graphics guy isn't available, does anyone have suggestions? MoTD - Less than a week away! Talked to Way earlier and I am going to get the ECU flash done either tomorrow or at the Dragon. It's supposed to help the car run better and improve the gas mileage too. Agenda for MoTD? Drive, eat, sleep, repeat. MoTD 2009 - 2 weeks away! It's getting close to MoTD 2009. This year will be a lot different than year's past. Tapoco is closed for the season (and up for sale!) and it looks like most of BSM will be heading up on Saturday and not Thursday as we had in the past. I'm just glad to be getting out of town for a bit. It's been months since I've done any really fun driving, unless you count speeding on 75. Nothing new going on with the car to speak of. It's been a slow year for me as far as modding. I do need to get some new graphics made for the side windows as the ones that are on there are getting pretty faded. Thinking I will probably keep the same design, just get cleaner copies made and applied. With it only being a couple of weeks away, I've still got a lot of little things to do before the trip, repaint the calipers, detail the inside of the car, buy beer (dry county) and dramamine, you know..the usual. We're staying at Blue Waters this year. Great place, very nice, but a little further from the Dragon than we'd like. Like I said, just glad to be getting away for a bit. No phone, no TV, no internet. Ahhh. Hope to post again before we leave. If not...well, sorry? HD Theatre aired an episode of Monster Garage where they attempted to put a Hyabusa turbo motor into a Peel Micro Car. 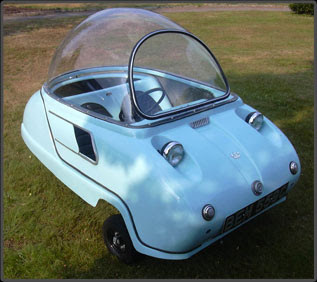 If you never seen a MicroCar, you should check out the MicroCar Museum in Georgia. It is by far the most comprehensive of micro, small and exotic imports in Georgia. We had the chance to go there a year or so ago and had a great time! I don't condone speeding at all...it just seems to happen to me...a lot. Driving into work this morning I found myself hitting 80+ without really noticing until I saw the Cobb County PD sitting on the side of the road. I was going with the flow of traffic, but thought for sure I was busted. Luckily he didn't pull me over. Whew! I got pulled over September of 2007 for going 85 in a 55. First time I had been pulled over in 15 years!! I did the no contest plea in order to not get points on my record. I know, I know, I should be careful when I drive, and I am. But sometimes, you just have to go fast. Driving to an appointment Saturday morning I saw a beautiful blue Mini with white bonnet stripes and driving lights. I waved at the driver and saw that he had a coffee mug in his hand, being raised to take a drink. Even though, he still made the effort to wave at me in return. Now, I don't know if there is some handbook that comes with Classics, but it should be included with all new gen MINIs. I cannot tell you how many times I have waved at someone and they look at me as if I have 2 heads. When I bought my MINI 4 years ago I didn't know anything about the friendly MINI owner attitude. Luckily when I bought my car, I had some good people around me at the dealership (Global Imports MINI) and they told me some of the MINI manners. Like waving at people and also to make sure when you park your MINI, you don't pull all the way into the spot, making people think there is a parking spot, when in fact, it is your little car there. 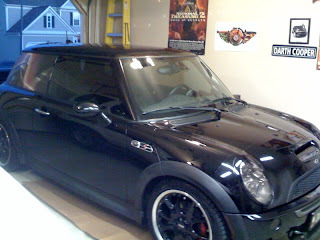 The point of this post is, please wave if you see other MINI/Mini owners out there. If you can't wave, point, honk, flash, stick up a finger (but not that one) just do something to acknowledge the MINI love! Many people look at their car as a way to get from point A to point B. I am not one of those people, nor have I ever been. As a child in the 70's my favourite thing to do was play with Hot Wheels. Amongst my favourites were my "Smokey and the Bandit" edition of a TransAm and a classic Mercedes Gullwing. I actually still have both of those in a box. The Mercedes is missing a door, but it's still a fave. When I was a teenager I had pictures of a Porsche 944 on my shelf. A guy that I dated won one of those balloon popping games and when he collected the prize for me, I asked for the mirror with the red Lambo on it, not the one with the unicorn or latest teen hearthrob. My sister was the same way when she was a teenager. She could name cars from the sound and a vague outline. I think we got the motoring bug from our Mother. The car I remember travelling in the most was a red 1975 Camaro with the white landau top. My mother had a few other Camaro's throughout the years, including a blue Berlinetta and finally a "fawn" 1984 Coupe. This was my first car, the car that started it all. My sister now drives an SUV that hauls her family and groceries out to the ranch in West Texas. My mother has a sensible Nissan Altima that got high ratings in the NHTSA crash tests. While I cannot see myself driving the big muscle cars that I rode in as a kid, I think the "seed of speed" was planted early and still lives on today. I commute about 60 miles a day round trip. I've been commuting for almost 8 years. How is that I've maintained my sanity this whole time?my car. I like driving my car it's fun & it's fast. Well, my car & my iPod. Yes, that is the key to a tolerable commute. Good car & good music. We got out and gave the car a quick wash, just to knock the layer of filth that was slowing the car down. Quick shot of the car from the iPhone, so excuse the quality.